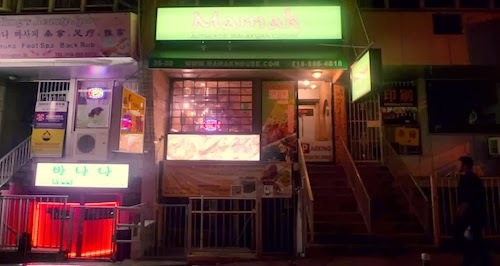 My understanding of the word "mamak" must be a bit imprecise, for my expectations were definitely not met during a recent outing to Mamak House, Flushing's new Malaysian outpost on the north side of Northern Boulevard. During my time in Malaysia and specifically Kuala Lumpur, I would constantly see the word on Indian establishments and took it to define the Muslim Indian population of the country, who make up a little less than 10% of people in Malaysia. I would wake up every morning and crave these mamak curries that I could smell from my room. I could be wrong here, but I think the word is improperly used here, as this is a distinctly Malaysian restaurant. 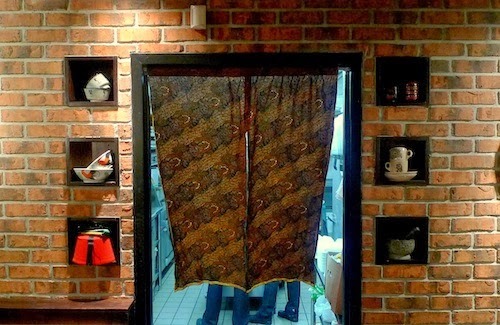 A Malaysian Malaysian restaurant. So yes, I have to get it out. I was disappointed when I saw the menu here. The good news? 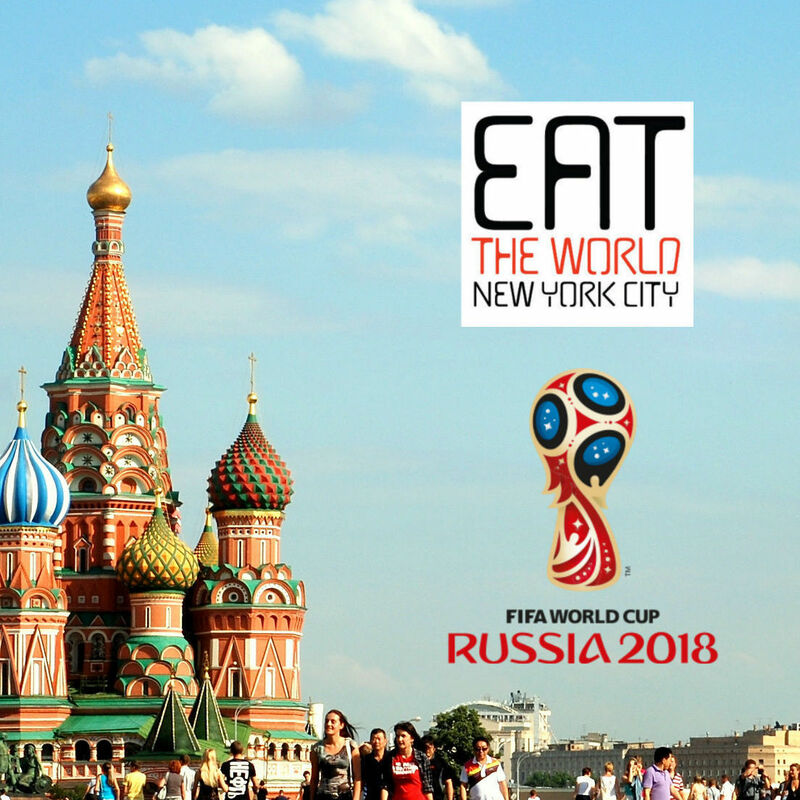 It is absolutely the city's best Malaysian restaurant. Mamak House is currently not serving alcohol, but offers a nice teh tarik ($2.95, above), which you would find a street vendor pouring back and forth between two cups at arm's length. This makes a good froth and cools down the piping hot liquid before drinking. Here the Indian milk tea is brought to the table in a clean cup with no signs of pulling. Those of us not in the mood for a hot beverage mostly ordered air sirap limau ($1.95, below), translated loosely to lime syrup water. 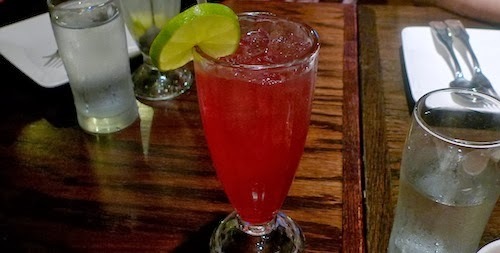 It is colored by rose syrup, and is a big hit with children (and adult New Yorkers). First to the table was a nice plate of pasembur ($7.95, below), a salad of cucumber, potatoes, tofu, turnip, sprouts, and more. This version is mild and has softer textures than usual, possibly due to the fact it had no fritters of any kind like some do. 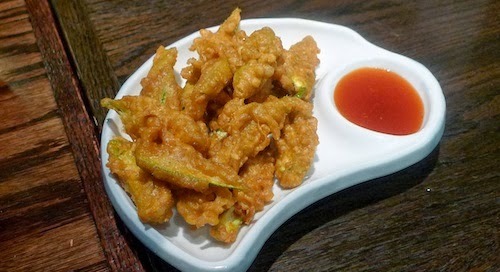 To cure this lack of crispiness, we could have added pieces of the crispy okra ($8.95, below), which was exactly as you might guess, and came with a sweet red sauce for dipping. Before we started eating, the gracious owner of the place passed us a hand-written list of items she plans to add to the menu. There were five on the list, and all were things you would find at hawker stalls at a night market. We were intrigued and agreed on a couple of them, the first being nasi goreng kampung ($7.95, below), which she translated as "village fried rice." This is a subtle yet lovely mix, perfect for a late night snack and easy to alter with sauces of any kind depending on your mood. It came with two small skewers of chicken. The other night market dish was char keow teow ($7.95, below), fried noodles served with a side of peppers in pepper sauce that can really kickstart your tastebuds. 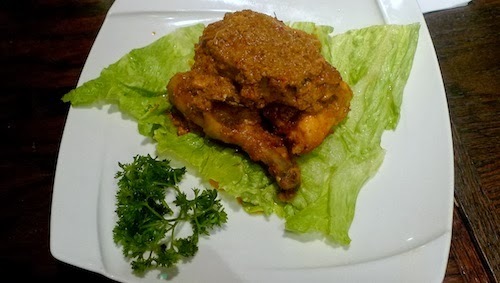 This dish is most popular in Singapore but also is eaten in Malaysia and Indonesia. 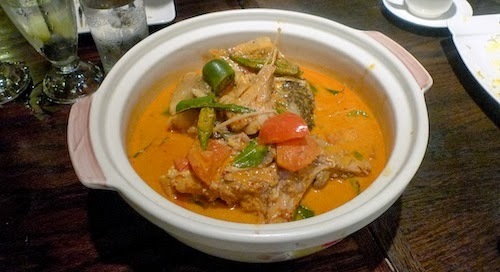 Amongst three tables of really good food, the highlight of the night for me was the kari kepala ikan ($28.95, below), the famous fish head curry. Our fish did not have a ton of meat on the unidentified species, but no matter, the curry in this large bowl was intensely satisfying and delicious. I do not think I have ever had such a complex curry before. Midway through we received a complimentary plate of lamb rendang (below), which was full of flavors like chili, ginger, and garlic. Somehow it is like eating the Earth (in a good way), if that makes any sense. The Ipoh bean sprouts ($6.95, below) I wanted on the table simply for the fact that the name of Malaysia's third city and culinary capital was in the title. The simple vegetable dish is made interesting by the tangy "special sauce." Unfortunately in this country, our bean sprouts are not as good as the ones used in so many dishes of Ipoh. Their bean sprouts are famously crunchy, and more compact. More rendang came in a chicken version with the ayam rendang ($13.95, below), which I have already described about for its earthiness. I personally like the pairing more with this tender chicken, which seems to take in more of the spices rather than just sit in sauces. Using the same "special sauce" was the lettuce with garlic flake ($7.95, below), which uses slightly soft iceberg. I think this might have been a grasp for more green at the table, but is enjoyable despite its simplicity. I felt bad digging into our first dessert, the beautiful ais kacang ($3.95, above), a steal for the price. 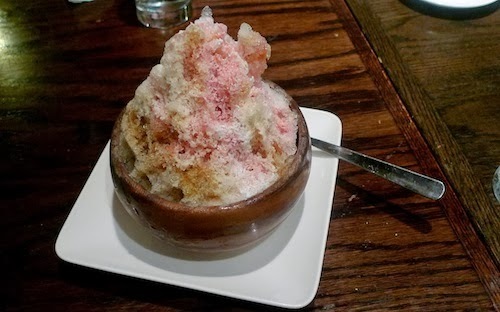 This shaved ice dish is full of flavors and textures, sweet red beans, grass jelly, corn, peanuts, and a lot of condensed milk. 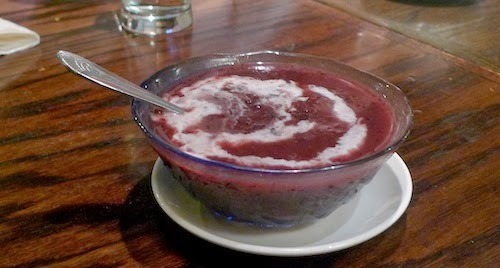 Small bowls of bubur pulut hitam ($3.95, above) and gandum ($1.95, below) followed. The former is a black glutinous rice porridge served warm and containing very neutral tastes, good for the end of a spicy meal. Gandum is a wheat porridge that contains coconut and milk and is more sweet. We were a big group, and the only people present on a Wednesday evening. Two of my companions have written glowing reviews of the restaurant already and we were given lovely treatment through the night. We all left satisfied and smiling, and could not have asked for a better meal, all things "mamak" aside. The kitchen door, employees only.